Cake? Did someone say cake? 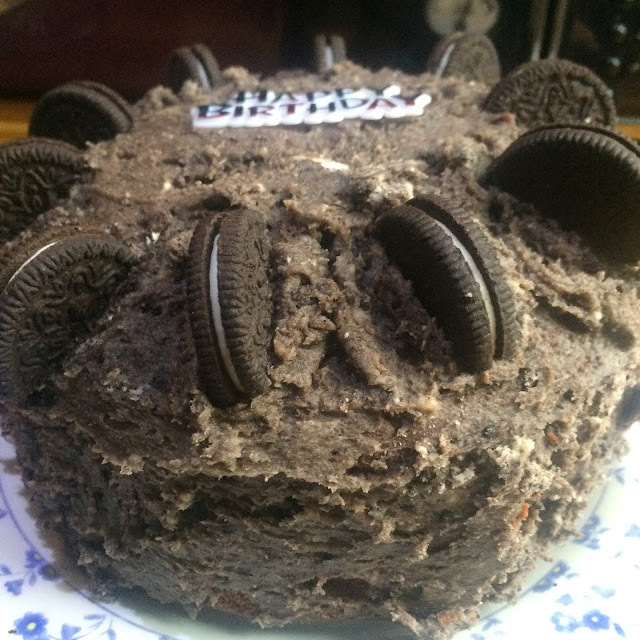 Why not start off the second month of the year by throwing all of those healthy new years resolutions away and making this absolutely mouth watering God of cakes- if I do say so myself. 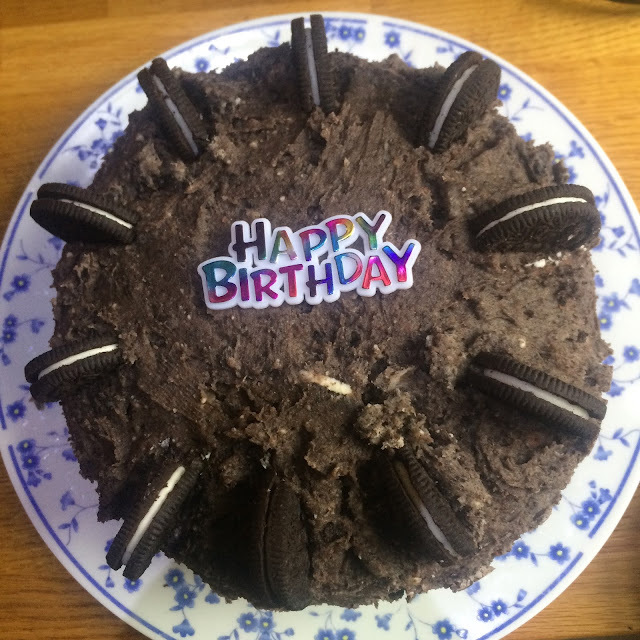 I love baking and love cake and love oreos so I thought I'd combine all of this and create an easy masterpiece for you to replicate one day! Why not expand Alice's Antics into a baking blog? That probably (definitely) will not happen. 1. Set the oven to 180C/160C/Gas Mark 4... Next follow the secret tip (found in a Hugh Fearnley-Whittingstall recipe book) which has never failed me, weigh out the eggs and match the sugar, butter and flour to whatever the scales of the eggs say. Do this and set aside. 2. Melt the dark chocolate in a bowl on top of boiling water to avoid it burning, keep an eye on it and set aside when it's completely melted. 3. Add the sugar, flour, cocoa powder and eggs and beat until the eggs are completely mixed into the mixture before adding the butter, whisk by hand or with an electric whisk if necessary and when the butter is completely blended, stir in the dark chocolate until it is spread evenly throughout the mixture. The mixture should be runny enough for it to fall off the spoon easily if scooped up. 4. Pour the mixture equally into the two cake tins and put in the oven for approximately 20-25 minutes, until completely risen, if unsure insert and knife/skewer and check when inserted it comes out clean- then they will be ready! Take out of the tins and leave to cool on a cooling rack. 5. Whilst the cakes are cooking and cooling, start to crack on with the icing! Mix together the butter and sieve in half the icing sugar to avoid lumps, once they're completely mixed, add the other half before finally whizzing together with the cream cheese. Set aside. 6. I do this the old fashioned way but you can always use a foot processor. Put the pack of oreos into a sandwich or freezer bag and ensure there's enough room (use 2 if necessary). Using a rolling pin, smash up the oreos into little pieces and pour into the icing mix spariodically, using a wooden spoon to ensure the entire mixture is filled with oreos. 7. Once the cakes are completely cooled, put onto a plate and spoon the mixture into the inside centre of one half, before sandwiching the slices together and spreading the rest of the mixture evenly, covering the entirety of the cake. 8. 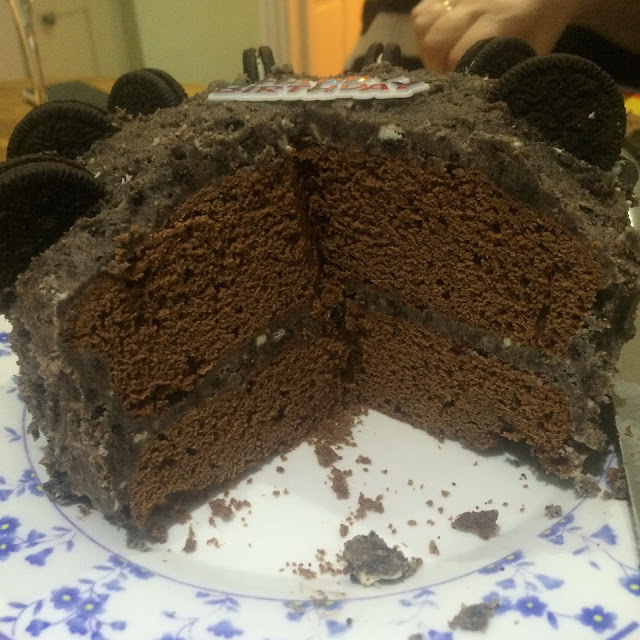 Break the second pack of oreos in half and use to decorate, go crazy! I hope you enjoyed something a little different of Alice's Antics.